Nestled between snaking Spiti river and barren skyscraper Himalayan cliffs is a green oasis of a village,Tabo at an altitude of over 10500 feet. 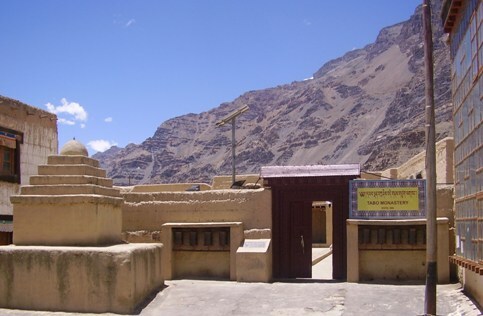 Tabo is world known for the 1020 year old Buddhist monastry which is the oldest active Gompa in the Himalayas. The Nine temple complex,made of pure mud, has withstood the harsh climate of the cold desert for this long many years. There are many priceless collection of Buddhist pantheon thangkas (scroll paintings), manuscripts, well-preserved statues, frescos and extensive murals that cover the entire sanctum walls, thus terming it the ‘Ajanta of the Himalayas’. UNESCO is considering the complex to be listed as World Heritage Site. There is also a beautifully designed modern Stupa and newly built monastery with training facilities for Lamas. Caves burrowed in the steep and barren cliffs were used by the Lamas for Meditating in harsh weather. Caves are generally cool in summer and warm in winter, thus providing ideal environment for uninterrupted meditation. Cave walls in Tabo are covered with Thangka paintings. Caves at Lari, a pleasant treking distance of Five kilometers from Tabo, are active even today with daily worshiping rituals by a Lama. 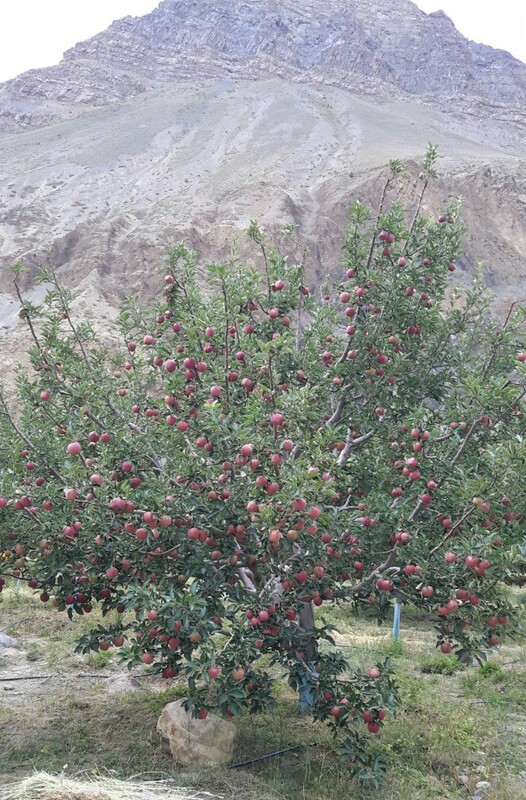 A few Àpple trees were planted in Spiti in 1974 and on its success,it has become the major cash crop that has transformed the economic life of the Tibeto Mangoloid Schedule Tribe of the Sham valley. Owing to high altitude and low temperature, the fruit matures slowly thus resulting in juicy,crispy,tasty fruits with attractive red colour and good keeping quality. Spiti Apples are recognised as one of the better qualities in India ,if not the best, fetching at garden gate over Rs.100 per kg retailing at Rs.250 per kg in Metro Cities. Apart from Apple, Sand Pear, Apricots,Plum,Grapes are also grown though not commercially yet. In 1974 ,during the post avalanche relief,the Indian Army discovered a Mummy Lama in a broken stupa.It was later confirmed by carbon dating to be that of a meditating 45 year old lama ,Sangha Tenzin,dated back to 1340 A.D. 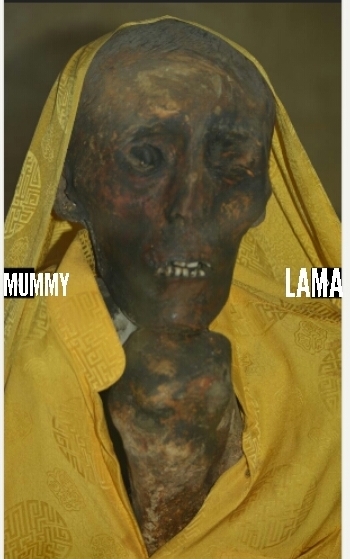 This 675 year old Mummy with hairs,nails and teeth intact has been housed in Geu monastery,about 30 Kms from Tabo. Doesn’t the word Mummy raise curiosity to anyone? Where ever you land in India, domestic flights, trains and deluxe buses connect you to NEW DELHI or CHANDIGARH, from where you can plan your entry to Spiti valley. There are two routes from Chandigarh to enter the valley; one via Shimla-Rampur-Recong Peo-Nako and the other via Manali-Rohtang pass-Kunzum pass. From New Delhi (12 hour drive or fly to Bhuntar Airport (60 kms to Manali) or overnight bus) to Manali – The road from Manali to the valley is only open from around mid June through to mid October. Access to Spiti is over the high passes of Rohtang and Kunzum at 3000 metres and 4500 metres respectively. These passes can temporarily close at any time due to high snow fall or land slide. Local state buses (12 hours) or HIRE / SHARE 4 WD taxis (9 hours) connect Manali to Kaza. Inner line permits will have to be obtained in Manali/ Kaza by Non Indian citizens, for onward journey in Spiti valley. From New Delhi (12 hours drive or fly to Shimla or by train to Kalka, where change over) to Shimla. – The road from Shimla to Spiti Valley is open all year around except for occasional land slides and/or heavy snow fall. Local buses connect Shimla to Rekong Peo, (10 to 12 hours). An Inner Line permit (this permit allows a Non Indian citizen to travel from Rekong Peo to the valley) will have to be obtained in Recong Peo. HIRE / SHARE 4 WD taxis are also available in Shimla, Rampur and Rekong Peo to travel to the valley. Travel within the valley – Local State buses and taxis are available for travel within the valley. 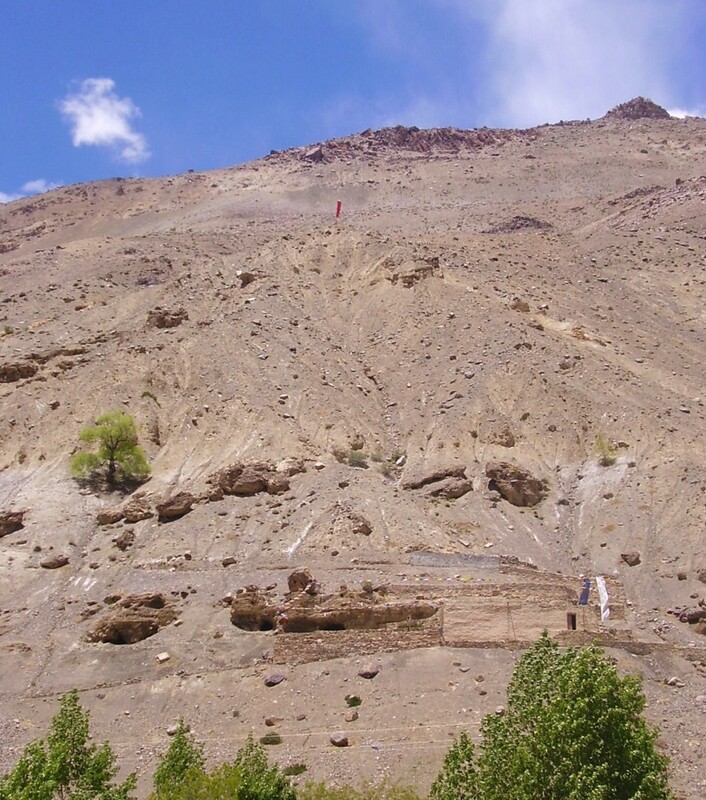 Since the infrastructure is poor in Spiti valley, the roads in/out of the valley can get cut off at any time due to landslides, rock slides and sudden stream overflow either due to rain or snow melt. July and August are hot; need to carry full arm cotton tops, sun glasses, wide brimmed caps, sun screen creams and chap stick. Other months are cool and could get chilly windy anytime. Carry woolens and thermal wear. Electricity supply is poor and therefore, carry extra batteries n power bank for camera/mobile,etc.,. Please carry prescribed high altitude and asthma medicines, as the average elevation of the valley is 4200 meters. Carry cash from Manali, Recong Peo or Shimla ,as there are only two ATMs in Tabo n Kaza and a foreign currency exchange facility in Kaza Branch of SBI. Only BSNL mobile network is receptive in Tabo and Kaza; obtain a BSNL sim card. Internet services are available in Tabo and Kaza, but the speed is in Kb not Mb ! August are the hottest months. The valley being a cold desert is extremely cold in winter and precipitation is very scarce in monsoon. Both the roads are prone to temporary blockage due to snow, gale and landslide anytime. Nevertheless, road and weather are ideal throughout the year for the daring and adventure lovers !